Definition at line 1995 of file compat.h. Definition at line 1998 of file compat.h. Referenced by elem_wire_size(), SafeArrayCopyData(), test_marshal_LPSAFEARRAY(), test_PropVariantCompare(), and test_safearray(). Definition at line 1996 of file compat.h. Referenced by check_safearray(), document_write(), LPSAFEARRAY_UserUnmarshal(), SafeArrayCopyData(), SLTG_DoType(), test_marshal_LPSAFEARRAY(), test_PropVariantCompare(), and test_safearray(). Definition at line 1999 of file compat.h. Referenced by check_safearray(), test_marshal_LPSAFEARRAY(), test_PropVariantCompare(), and test_safearray(). Definition at line 1997 of file compat.h. 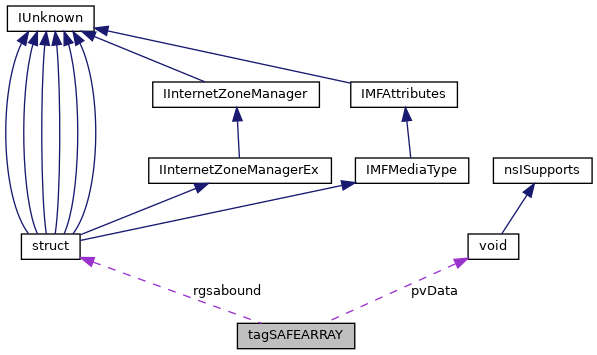 Referenced by check_safearray(), test_marshal_LPSAFEARRAY(), test_marshal_VARIANT(), test_PropVariantCompare(), test_safearray(), test_SafeArrayCopy(), and test_SafeArrayCopyData(). Definition at line 2000 of file compat.h. Referenced by async_doc_navigate(), test_marshal_LPSAFEARRAY(), test_marshal_VARIANT(), test_PropVariantCompare(), and test_SafeArrayCopyData(). Definition at line 2001 of file compat.h. Referenced by check_safearray(), document_write(), SafeArrayCopyData(), SLTG_DoType(), test_marshal_LPSAFEARRAY(), test_PropVariantCompare(), test_safearray(), and test_SafeArrayCopyData().